14/20 Gold Filled 1.1mm 21 gauge Cable Ear Thread, 1.5mm Open Ring ID, 80mm Overall Length. Order 2 pieces to get one pair of earrings. Ear threads make it easy to create eye-catching, on-trend earrings. 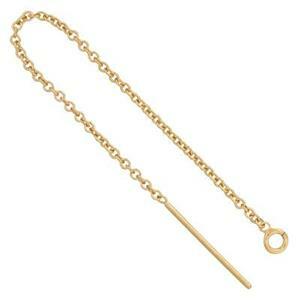 This 1.1mm gold-filled ear thread has a loop on one end for attaching a charm, small pendant or your own creation. To learn more about gold-filled products, read our blog post 5 Things You May Not Know About Gold-Filled.